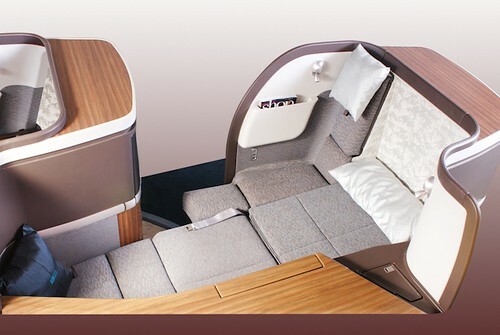 Cathay Pacific First Class Flat Bed, a photo by bloompy on Flickr. Cathay Pacific from LAX to HKG has long switched from using the 747 to 777. This was due to the fact that with the 777, it can fly for an approximate maximum of 17 hours, thus, ensuring a non-stop flight to HKG from LAX (15 hours) and from SFO (14 hours). It used to be that during the winter months, LAX-HKG B747 flight most likely must refuel in Korea prior to continuing to HKG.